President Raymond M. Burse and Kentucky State University are pleased to announce John L. Smith as the new head football coach of the Thorobreds. Smith, who has been a high-profile staple in Kentucky as a former head coach at the University of Louisville from 1998 to 2002, was introduced in a press conference Monday in the Exum Center. 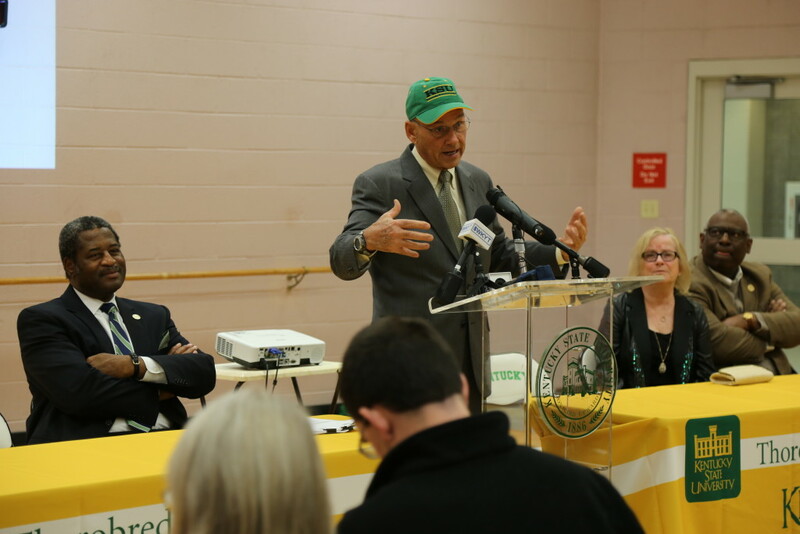 Smith comes to Kentucky State with more than 40 years of college coaching experience and more than 20 years as a head coach. He has posted a 150-113 record at six schools as a head coach, including, most notably, stops at Louisville, Michigan State University, and the University of Arkansas. Most recently, Smith has spent three seasons at Division II Fort Lewis College, where he inherited a team that had been 0-10 in 2012 and posted a 7-4 record this year, equaling the program’s best record in 40 years. 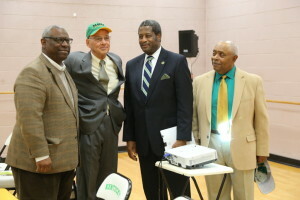 Rep. Derrick Graham, from left, head football coach John L. Smith, President Raymond M. Burse and Athletic Director William Head attend the press conference Monday at the Exum Center at Kentucky State University. Upon accepting the position, Smith is looking forward to returning to Kentucky and looking forward to making a positive impact on the Kentucky State football program. Prior to his time at Fort Lewis, Smith served as special teams coordinator and linebackers coach at Arkansas from 2009-11 before serving as the team’s head coach for one season in 2012. He also spent four seasons at Michigan State, where he went 22-26 from 2003-06 and won Big Ten Coach of the Year honors in 2003. In addition to the Big Ten Coach of the Year award, Smith was a national finalist for the Eddie Robinson Coach of the Year award in 2000. He has made 12 postseason bowl or playoff appearances, and he is one of just 19 coaches in collegiate football history to take three different schools to bowl games. Before his time at Michigan State, Smith went 41-21 at Louisville from 1998-2002, a stretch that included five straight winning seasons, five straight bowl appearances, and two conference championships. Smith also has head coaching stops at Utah State University as well as the University of Idaho, where he went 53-21 from 1989-94 and left as the school’s winningest head coach. An Idaho Falls native, Smith holds a Bachelor of Science in Physical Education and Mathematics from Weber State University, where he was a linebacker and quarterback in his collegiate playing days. He also holds a Master of Science in Physical Education from the University of Montana. In addition to his head coaching experience, Smith has served in various assistant coaching roles at Idaho, Weber State, and Montana, as well as with the University of Nevada, University of Wyoming, Washington State University, and the St. Louis Rams.